We are in the process of launching a further report which reviews and analyzes the data and reports that we received in 2013. The report also covers the Woolwich period and the backlash against Muslim communities through on-line and off-line hate incidents after the murder of Lee Rigby. 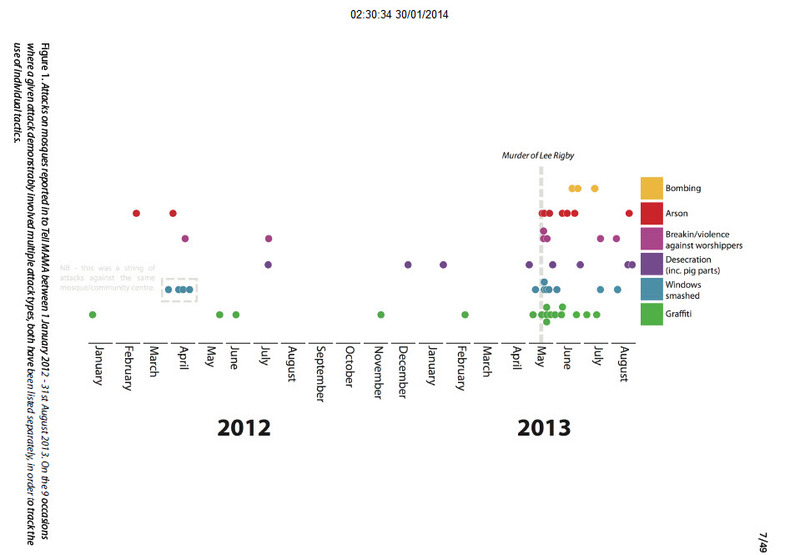 The report will be out in 4-5 weeks though we thought that this graphic visually represents the intensity of mosque incidents and attacks post the end of May and early 2013. It is a shocking reminder of the impact of the death of Lee on cohesion and community relations. The clustering of attacks and the serious nature of them reflects a period in which hate incidents and attacks were coming in at a significant pace when compared to pre-May 2013. We request that if this graphic is used, that you reference it to us at TELL MAMA. Thank you.